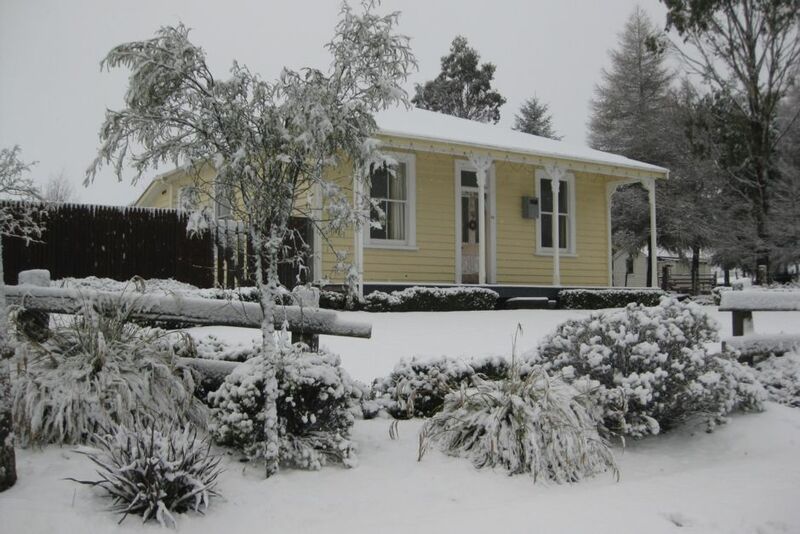 A beautifully refurbished warm and cosy original Railway cottage in the quaint village of National Park, the Gateway to the Central Plateau area and the dual World Heritage listed Tongariro National Park. This has been a family holiday home for thirty years, but now we want to share it with you, so you too, can enjoy the multitude of exciting adventures this stunning part of our country has to offer. In the well-appointed beautifully sunny, north facing kitchen, you will find everything at your fingertips. We've purposely left out the draws and cupboards so you can see where everything is at a glance and there's a flash new stove with gas hobs. The cosy, comfortable lounge area is open to the kitchen and dining area. There are two bedrooms with queen beds and a large bunk room for the kids (2 pairs of bunk beds) which have been custom made, so plenty of head room for adults to sit and read. All the beds have electric blankets. There's heated towel rails in each of the bedrooms and a shower that NEVER runs out of hot water. Duvets and pillows are provided. All other linen (including snuggly flannette sheets) is available on request and at an extra charge per person for the duration of your stay. There's two drying racks especially designed for drying footwear i.e. ski/board boots and other footwear, gloves hats etc. Lockable shed for skis, plenty of off street parking (4+ cars),attractive lawn and garden areas with a large lawn area at the back of the house where children can play safely. A two minute walk to the lovely Station Cafe. Other cafes and pubs are an easy walk. Walk the perimeter of the village in 25 minutes and enjoy the bright starry nights. Our skies are so clear here. Four hours from Auckland and a little more from Wellington. Don't forget to check out D.O.C. 's amazing Summer Time Programme. They provide a range of extremely interesting guided one day walks and excursions. There's something for all the family. The perfect location for all activities in the Central Plateau area. An area with two wash basins, a seperate toilet and a seperate shower. Very efficient wood burning fire. Linen is optional. $15.00 per person per stay if you want. A fantastic wood burning fire. There is a ceiling fan that does a great job in moving the warm air around and heaps of wood in the wood shed. A new stove. Gas hobs with electric oven. The kitchen area faces north east so catches sun for most of the day and has a view to the mountain. A small box of toys books. Large deck that catches east and north sun. We just love her warm hearted welcoming. We definately go back. Excellent cosy cottage. Definitely would recommend. We stayed 2 nights at this cosy cottage. Very well presented and clean. Views from the back deck towards the mountains. Janet called to check if everything was Ok & whether we needed anything, which we thought was lovely. This was an ideal location to get onto the Tongariro Crossing. Thank you! National Park's best kept secret! Spacious, clean, private, character home with a view of Mt Ruapehu. Would definitely stay here again. Enjoyed restaurant meal a short walk away down at the Station. A stunning little house in a place where you can escape and enjoy nature. Thank you again for the beautiful property! Thanks for choosing our house. We're delighted to know you had a lovely stay. Thank you so much for leaving the house so brilliantly clean and tidy, it was like no one had been there. We would love to have you to stay again.